For the historical event, see Death and state funeral of Joseph Stalin. The Death of Stalin is a 2017 political satire black comedy film written and directed by Armando Iannucci and co-written by David Schneider, Ian Martin and Peter Fellows. It stars Steve Buscemi, Simon Russell Beale, Paddy Considine, Rupert Friend, Jason Isaacs, Michael Palin, Andrea Riseborough, and Jeffrey Tambor, with Olga Kurylenko, Paul Chahidi, Dermot Crowley, Adrian McLoughlin, and Paul Whitehouse appearing in support roles. Based on the French graphic novel La Mort de Staline, the film depicts the power struggle following the death of Soviet revolutionary and politician Joseph Stalin (Adrian McLoughlin) in 1953. The Death of Stalin was screened in the Platform section at the 2017 Toronto International Film Festival and received critical acclaim. It was released by eOne Films in the United Kingdom on 20 October 2017, in the United States by IFC Films on 9 March 2018, and in France on 4 April 2018. The film was banned in Russia, Kazakhstan and Kyrgyzstan because of its perceived anti-Soviet theme. It received a Magritte Award nomination in the category of Best Foreign Film. In the USSR in 1953, General Secretary Joseph Stalin is listening to a concert on the radio and orders that a recording of it be delivered to him. The concert has to be hurriedly repeated and recorded, but the pianist, Maria Yudina, hides a note to Stalin in the sleeve of the record, saying he has ruined the country. As Stalin reads the note in his dacha, he suffers a cerebral hemorrhage and becomes paralysed. The members of the Central Committee are alerted. The first to arrive are Interior Ministry (NKVD) head Lavrentiy Beria, who discovers Yudina's note, and Deputy General Secretary Georgy Malenkov. As Malenkov panics, Beria encourages him to take the leadership, hoping to use him as a puppet. Moscow Party Head Nikita Khrushchev arrives with the rest of the Committee, except for Foreign Minister Vyacheslav Molotov, whom Stalin had added to one of his lists of enemies the previous night. Beria closes off Moscow, has the NKVD take over city security duties from the Soviet Army, and replaces Stalin's enemy lists with his own, reprieving Molotov. Khrushchev and Beria struggle for symbolic victories, including control over Stalin's daughter, Svetlana, and his unstable son, Vasily. Stalin dies, and the Committee members rush back to Moscow as the NKVD loot Stalin's dacha and execute witnesses. Khrushchev goes to Molotov's home and attempts to enlist his support, but Molotov, a true believer in Stalinism, opposes any factionalism within the Communist Party. Beria buys Molotov's loyalty by releasing his wife, Polina Molotova, from confinement. Malenkov is named Premier while being largely controlled by Beria. At the first Committee meeting following Stalin's death, Beria sidelines Khrushchev by putting him in charge of Stalin's funeral and suggesting the introduction of many of the liberal reforms which Khrushchev had already planned. Stalin's body is laid in state in the Hall of Columns, while many political prisoners are released and restrictions on the Russian Orthodox Church are loosened, earning Beria more popular support. Field Marshal Georgy Zhukov arrives and demands to know why the Soviet Army has been confined to barracks within Moscow. Beria learns that Khrushchev has a passing acquaintance with Maria Yudina, who has been hired to play at the funeral, and threatens them both that he will reveal Yudina's note. Khrushchev approaches Zhukov, who agrees to provide the Army's support in a coup to overthrow Beria, but only if the Committee agrees. To undermine Beria's popularity, Khrushchev orders the resumption of trains into Moscow, allowing thousands of mourners into the city. As Khrushchev has guessed, the NKVD guards around the Hall fire on the crowd, killing 1,500 people. The Committee suggests scapegoating low-level NKVD officers, but because Beria believes any blame attached to security services will tarnish him, he angrily threatens the Committee with incriminating documents he has collected on them. Molotov secretly tells Khrushchev and Lazar Kaganovich he will support the coup if they can enlist the support of the others, including Malenkov. On the day of Stalin's funeral, Khrushchev lies to the Committee and Zhukov that he has Malenkov's support. The Soviet Army overwhelms the NKVD and takes up positions outside the conference room. Zhukov and his men arrest Beria, and Khrushchev coerces Malenkov into signing the papers for Beria's trial. Following a kangaroo court, Khrushchev and his allies find Beria guilty of treason and of sexual assault, and execute him. As Beria's body is burnt, Khrushchev gives Svetlana a ticket to Vienna and assures her that her brother will be cared for. Several years later, Khrushchev, now leader of the Soviet Union, having removed his co-conspirators, attends a concert given by Maria Yudina, while future leader Leonid Brezhnev, only a row above, watches him. The project began development during the 2016 Cannes Film Festival. Armando Iannucci was set as director and writer, alongside his The Thick of It co-writer Ian Martin. Production is due to begin in June, with Jeffrey Tambor, Steve Buscemi, Olga Kurylenko, Timothy Dalton, Toby Kebbell, Michael Palin, Simon Russell Beale, Paddy Considine and Andrea Riseborough amongst the cast. Production began on June 20, with Adrian McLoughlin, Rupert Friend, Jason Isaacs and Paul Whitehouse joining the cast. Dalton and Kebbell would ultimately not feature in the film. Production began 20 June 2016 and ended 6 August. Filming locations included Kiev, Ukraine (for exteriors scenes and exterior of Public Enemies building and NKVD building), and the United Kingdom (at Blythe House, Freemasons’ Hall and Alexandra Palace in London, Mongewell Park in Oxford, Hammersmith Town Hall in London). The Death of Stalin was released by eOne Films in the United Kingdom on 20 October 2017 and IFC Films in the United States on 9 March 2018. The film was screened in the Platform section at the 2017 Toronto International Film Festival. The Death of Stalin grossed $8 million in the United States and Canada and $16.6 million in other territories (including $7.3 million in the UK), for a worldwide total of $24.6 million. Nikolai Starikov, head of the Russian Great Fatherland Party, said The Death of Stalin was an "unfriendly act by the British intellectual class" and part of an "anti-Russian information war". In September 2017, the head of the Public Council of the Russian Ministry of Culture said Russian authorities were considering a ban on the film, alleging the film could be part of a "western plot to destabilise Russia by causing rifts in society". On 23 January 2018, two days before film's scheduled release in Russia, a screening was attended by State Duma MPs, representatives of the Russian Historical Society, members of the Culture Ministry's Public Board, and film industry members. Two days later, the Ministry of Culture withdrew the film's distribution certificate. However, several cinemas screened the film in late January, claiming that by then they did not receive any information that the movie's exhibition license was revoked. Russia's culture ministry filed a lawsuit against these theatres. According to the results of a poll conducted by the state-run Russian Public Opinion Research Center (VTSIOM), 35% of Russians disapproved of the Culture Ministry's decision to pull the film off the screens, while 30% of respondents supported the ban and 35% of remained neutral. 58% of Russians said they would be prepared to watch the film in cinemas if the ban were lifted. Despite the ban the film has been illegally downloaded around 1.5 million times in Russia. A group of Russian Culture Ministry's lawyers, including the daughter of Marshal Zhukov, Era Zhukova, cinematographers Nikita Mikhalkov, Vladimir Bortko, and Head of the Russian State Historical Museum Alexey Levykin, petitioned Culture Minister Vladimir Medinsky to withdraw the film's certification, saying "The Death of Stalin is aimed at inciting hatred and enmity, violating the dignity of the Russian (Soviet) people, promoting ethnic and social inferiority, which points to the movie's extremist nature. We are confident that the movie was made to distort our country's past so that the thought of the 1950s Soviet Union makes people feel only terror and disgust." The authors said the film denigrated the memory of Russian World War II fighters. They pointed out that the National Anthem was accompanied with obscene expressions and offensive attitude, decorations were historically inaccurate, and that the planned release on the eve of the 75th Anniversary of the Battle of Stalingrad was "a spit in the face of all those who died there, and all those who are still alive". The film was banned in Russia, Kazakhstan, and Kyrgyzstan. Armenia and Belarus were the only members of the Eurasian Economic Union to show it. In Armenia, the film premiered in two theatres in Yerevan on 25 January 2018. In Belarus, the film premiered after an initial delay. In Kazakhstan, the film was screened only in the Clique festival. On the review aggregator website Rotten Tomatoes, the film holds an approval rating of 96% based on 228 reviews, with an average rating of 8.1/10. 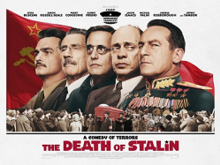 The website's critical consensus reads, "The Death of Stalin finds director/co-writer Armando Iannucci in riotous form, bringing his scabrous political humor to bear on a chapter in history with painfully timely parallels." On Metacritic, the film has a weighted average score of 88 out of 100, based on 42 critics, indicating "universal acclaim". Donald Clarke, writing for The Irish Times, wrote that the film "starts in a state of mortal panic and continues in that mode towards its inevitably ghastly conclusion". In The Guardian, Peter Bradshaw wrote that "fear rises like gas from a corpse in Armando Iannucci's brilliant horror-satire". Bradshaw says it "is superbly cast, and acted with icy and ruthless force by an A-list lineup. There are no weak links. Each has a plum role; each squeezes every gorgeous horrible drop." Raphael Abraham, writing for Financial Times, wrote that "As this coven of vampiric apparatchiks feasts on the remains of Stalinism, the unremitting blackness of the situation at times threatens a full comedy eclipse. But the discomfiting balancing act of humour and horror is precisely Iannucci's game—and only he could pull it off with such skill." A number of academics commented on the historical accuracy of The Death of Stalin. Historian Richard Overy noted in The Guardian that the film "is littered with historical errors", which can be "viewed as cinematic license". Vyacheslav Molotov was not foreign minister when Stalin died but had been sacked in 1949, though he became so again in the post-Stalin reshuffle. Marshal Zhukov (not Field Marshal) was a local field commander when Stalin died, exiled to the provinces to satisfy Stalin's paranoid jealousy of his highly successful wartime deputy supreme commander. He became deputy minister of defence in the post-Stalin government but he was not the commander of the Red Army in March 1953. Nikita Khrushchev chaired the meeting to reorganise the government, not Georgy Malenkov, giving him a status he does not enjoy in the film. Beria was arrested three months after Stalin died, not almost simultaneously, and it was precipitated by the 1953 East German Uprising, not a massacre of mourners in Moscow, which is actually based on the 109 who were trampled to death during the funeral. Furthermore, Beria was not head of the security forces, a job he had given up in 1946. However, Richard Overy was most critical that the film did not appropriately honour those who died during Stalin's leadership. Director Iannucci stated that he "chose to tone down real-life absurdity" to make the work more believable. The Radio Moscow portion is a retelling of an apocryphal story first recorded in Solomon Volkov's book Testimony. However, as told by Volkov, it was Maria Yudina who was woken up in the middle of the night to be brought in to record, and the recording brought Stalin to tears, moving him to pay Yudina 20,000 rubles in appreciation. The story subsequently served as the loose basis for the 1989 BBC radio play The Stalin Sonata written by David Zane Mairowitz. Another smaller historical aspect of the plot was modified for the film, this being the 1950 Sverdlovsk plane crash which took the lives of 11 players on the VVS Moscow ice hockey team. In the movie Vasily Stalin and Anatoly Tarasov deal with a depleted Soviet Union national ice hockey team, complete with a reference to their star player Vsevolod Bobrov who survived when he missed the flight. In actuality the crash happened on January 5, 1950, over three years before the death of Stalin. Samuel Goff, at the Department of Slavonic Studies, University of Cambridge, while admitting that the film's historical discrepancies could be justified inasmuch as they helped focus the drama, found turning Beria into "an avatar of the obscenities of the Stalinist state" misses the chance to say "anything about the actual mechanisms of power." Goff believed that Iannucci's approach to satire was not transferable to something like Stalinism, and the film is "fundamentally ill-equipped to locate the comedy inherent to Stalinism, missing marks it doesn't know it should be aiming for." In response to the issue of historical accuracy, director Armando Iannucci said, "I’m not saying it’s a documentary. It is a fiction, but it’s a fiction inspired by the truth of what it must have felt like at the time. My aim is for the audience feel the sort of low-level anxiety that people must have [experienced] when they just went about their daily lives at the time." ^ a b "THE DEATH OF STALIN (15)". British Board of Film Classification. Retrieved 3 September 2017. ^ a b "The Death of Stalin (2017)". Box Office Mojo. Retrieved 2 September 2018. ^ a b c "Армения ударила по России "смертью Сталина" [Armenia struck Russia over the "Death of Stalin"]. Sputnik News (in Russian). 29 January 2018. Retrieved 22 June 2018. ^ Roxborough, Scott (14 January 2019). "'Girl,' 'Above the Law' Lead Belgium Film Award Nominations". The Hollywood Reporter. Retrieved 14 January 2019. ^ Jaafar, Ali (20 June 2016). "Armando Iannucci's 'The Death of Stalin' Starts Shoot, Rupert Friend Joins Cast, Closes Deals". Deadline Hollywood. Penske Business Media. Retrieved 3 April 2017. ^ Hipes, Patrick (11 February 2017). "Armando Iannucci's 'The Death of Stalin' Acquired By IFC Films – Berlin". Deadline Hollywood. Penske Business Media. Retrieved 3 April 2017. ^ Evans, Greg (5 October 2017). "'Death of Stalin' Author Says Trumpian Comedies Must Wait For Final Tweet – NY Comic-Con". Deadline Hollywood. Penske Business Media. Retrieved 26 November 2017. ^ Kay, Jeremy (3 August 2017). "'The Death of Stalin' to open Toronto Film Festival Platform programme". Screen Daily. Screen International. Retrieved 3 August 2017. ^ Walker, Shaun (14 October 2017). "In Russia, nobody's laughing at Iannucci's The Death of Stalin". The Guardian. Guardian News and Media. Retrieved 19 November 2017. ^ Bennetts, Marc (20 September 2017). "Russia considers ban on Armando Iannucci's film The Death of Stalin". The Guardian. Guardian News and Media. Retrieved 20 September 2017. ^ Kozlov, Vladimir (16 November 2017). "Russian 'Death of Stalin' Distributor Plans January Release". The Hollywood Reporter. Prometheus Global Media. Retrieved 23 January 2018. ^ Kozlov, Vladimir (23 February 2018). "Russia's Culture Ministry Sues Movie Theater for Screening Armando Iannucci's 'The Death of Stalin'". The Hollywood Reporter. Prometheus Global Media. Retrieved 1 June 2018. ^ "Russian society divided over 'Death of Stalin' film ban, poll shows". RT. 19 February 2018. ^ "Armando Iannucci on 'Death of Stalin' Success, Censorship and Why He Ditched His Trump Film Idea". The Hollywood Reporter. Retrieved 2019-03-18. ^ a b "Деятели культуры обратились в министерство с просьбой провести экспертизу фильма "Смерть Сталина" (на предмет соответствия законодательству РФ)" [Cultural figures appealed to the Ministry with a request to conduct an examination of the film "The Death of Stalin"] (in Russian). Russian Ministry of Culture. 23 January 2018. Retrieved 22 June 2018. ^ "Russian Culture Ministry yanks distribution certificate for The Death of Stalin". TASS. 23 January 2018. Retrieved 23 January 2018. ^ "Фильм «Смерть Сталина» все-таки покажут. Билеты уже продают - citydog.by | журнал о Минске". citydog.by (in Russian). Retrieved 2019-01-02. ^ "Armenia only EEU-member to screen 'The Death of Stalin'". PanARMENIAN.Net. PanARMENIAN Network. 29 January 2018. Retrieved 22 June 2018. ^ "The Death of Stalin (2018)". Rotten Tomatoes. Fandango Media. Retrieved 22 June 2018. ^ "The Death of Stalin Reviews". Metacritic. CBS Interactive. Retrieved 15 April 2018. ^ Clarke, Donald (20 October 2017). "The Death of Stalin: Mortal panic with a ghastly conclusion". The Irish Times. Retrieved 15 March 2018. ^ Bradshaw, Peter (9 September 2017). "The Death of Stalin review – Armando Iannucci has us tremblin' in the Kremlin". The Guardian. Guardian News and Media. Retrieved 15 March 2018. ^ Abraham, Raphael (16 February 2018). "The Death of Stalin – 'balancing act of humour and horror'". Financial Times. The Nikkei. Retrieved 2 March 2018. ^ Overy, Richard (18 October 2017). "Carry on up the Kremlin: how The Death of Stalin plays Russian roulette with the truth". The Guardian. Guardian News and Media. Retrieved 31 December 2017. ^ White, Adam (19 October 2017). "The Death of Stalin: what really happened on the night that forever changed Soviet history?". The Daily Telegraph. Telegraph Media Group. Retrieved 31 December 2017. ^ a b Goff, Samuel (23 October 2017). "The Death of Stalin: a black comic masterpiece? Don't make me laugh". The Calvert Journal. Calvert 22 Foundation. Retrieved 31 December 2017. ^ Tobias, Scott (10 March 2018). "Armando Iannucci on 'Death of Stalin', Political Satire and Trump's Funeral". Rolling Stone. Retrieved 26 March 2018.